Once books are scanned, there are several different steps to go through before they appear on the Living Archive website. All the metadata (information about the book, like title, the names of people involved in creating the book, date and place of publication, etc) is stored in a spreadsheet. Once a group of books is scanned, the metadata is double-checked on the spreadsheet, as this is the information that will appear on the website. Some categories have ‘controlled vocabulary‘ which means that the information has to match exactly – so things like place names have to spelt correctly. This can be a challenge for places or languages with different names, so we have created standard names such as Gunbalanya (Oenpelli) or Arrarnta, Western. Also, all creators are assigned a code so that people whose names may appear differently in different books can have all their items grouped together. Once they’re uploaded, we have to check which items can then be made public, which means they have had permission granted by all the relevant people. These items go into the ‘open’ collection which appears on the Living Archive website, and all the others stay in a ‘closed’ collection, awaiting permissions. Once they’re made public, the books appear immediately on the website, but sometimes the counting of items takes a day to catch up (these things reset overnight). We also need to link any ‘related items‘, such as translations in other languages or different versions, sometimes audio or multimedia files. Some books have lots of these, such as the Little Frog book which is in 6 different languages! Then all the files and folders are merged into the appropriate collections, on both eSpace and the local server. The whole process can take quite a while, and it rarely goes completely smoothly. We usually do a few collections at once, so hundreds of items may be uploaded at different points throughout the year. Despite all the quality control processes, we still manage to find errors – if you find any, feel free to let us know so we can fix them! This entry was posted in Technical and tagged archive, books, upload, website on February 5, 2015 by Cathy Bow. The gathering of around 35 linguists, language workers and librarians at Batchelor Institute this week was a significant event. 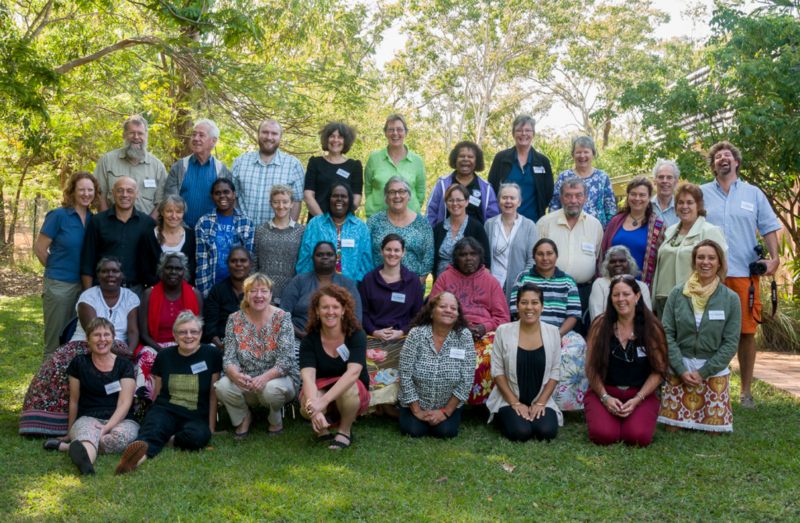 The Centre for Australian Languages and Linguistics (CALL) has been collecting language material from all over Australia for several decades, and selections from the Northern Territory language materials were the focus of attention at this gathering. After a warm welcome by Kungarakan traditional owner Helen Bishop, we went around the room asking people to share a little about themselves, including how long they’d been involved in Indigenous language work. When the total was finally tallied, it reached over 790 years! After the first break it was down to work. The Batchelor Institute librarians had been through the CALL collection and selected texts and books, placing them in boxes language by language. The participants worked in groups at tables — Wadeye,Tiwi , Maningrida, Yolŋu,Ngukurr, Numbulwar, Borroloola — while a big row of tables in the middle was for the desert mob working on Gurindji, Warlpiri, Pintupi-Luritja, Warumungu, Arrernte and other languages. Each book or document was in a plastic sleeve with a provenance sheet which needed to be filled out to audit and catalogue each item. Some items required information about who wrote or illustrated them, some needed the language to be identified, others required an English title or keywords, and some people spent time translating whole texts. Everything got a priority sticker, so we know which texts need attention first. Pairs of more experienced language workers worked with younger mentorees, or Indigenous language workers with non-Indigenous linguists. There was much laughter at some tables as documents prompted memories, and people or events were fondly recalled. Many stories both new and old were shared. Several participants brought their own materials to add to the CALL collection and LAAL. These included linguistic notes, transcripts of recorded stories, printed books, hard drives of digital materials, unpublished texts and recordings. The prize goes to Melanie Wilkinson who brought 11 boxes of material from her many years working among the Yolŋu! Runners-up were Ken Hansen, with thousands of pages of typed or handwritten materials in Pintupi-Luritja, and Mary Laughren who brought a trolley load of materials in Warlpiri and Western Desert languages. It would be a great opportunity for any student of linguistics looking for a project to work on, helping sort through these precious materials! An honourable mention to Patrick McConvell, whose box of books was inconveniently misplaced by Virgin en-route from Canberra, but arrived safely after the gathering concluded. There was so much work to do that we barely scratched the surface. Majella Chula and Jacinta Crocombe from Wadeye had already postponed their flight so they could be there to the end, and Magdalen Kelantumama and Dulcie Tipungwuti from Bathurst Island asked if they could come again to do more work on the Tiwi materials. As we wrapped up on the second day, Mätjarra from Ramingining commented that the workshop was “not long enough.” Samantha Disbray and Jane Simpson want to organise a workshop for the Warumungu community to do more with the materials, Margaret Carew and Marion Waiguma are already planning more activities for Maningrida languages, and Didamain Uibo wants to work on some of the stories with other Numbulwar people. Ailsa Purdon has plans for the communities she works with through Catholic Education. In the future it is hoped we will be able to do gatherings similar to this on a regional basis or with particular language groups. It was great to see so much material from communities and languages which were previously not represented in the Living Archive because they didn’t have bilingual programs. Susan Moore has already uncovered lots of materials in Alyawarr and Anmatyerre, Salome Harris and Angelina Joshua brought some materials from Ngukurr Language Centre, and Alan Rogers from AuSIL went through materials from Borroloola. 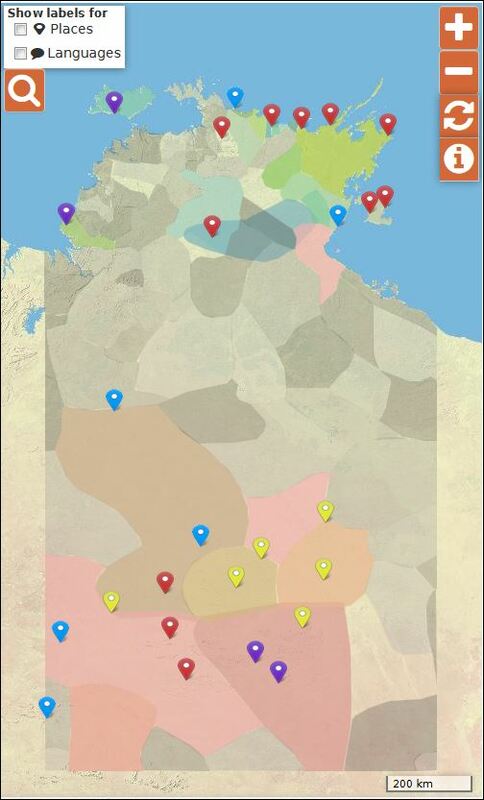 It will be exciting to see many of those grey regions on the Living Archive map turn to colour soon. Materials deposited in the CALL collection required a permission form to allow Batchelor Institute to look after and digitise what was being deposited. Materials that will be made public on the Living Archive website also require permissions, so more forms were signed. In addition, talent release forms were required for videos and photos being taken during the event, so by the end of two days everyone was thoroughly sick of signing their names! All the Batchelor Institute staff were incredible — Maree Klesch and Karen Manton did an amazing job getting the whole thing together, and support people like Narelle Verzeletti did everything from registration desk to airport pickups and cooking the BBQ (with T-bone steaks the size of your face! ), along with Elsie Carter and Marissa Clausen. Head of Research Peter Stephenson made us feel welcome, and Batchelor Institute director Adrian Mitchell dropped in and said he’d never seen the place look busier. The Batchelor Institute librarians were wonderfully organised with a carefully thought-through workflow which ran smoothly. Prue King and Kathy Roe were on the CALL desk, while Helena Turner and Lynne Shirley were at the New Deposits desk, with assistance from others when needed. In the library Colleen McBride had prepared an area for audio/video and slide digitisation, and a great deal of scanning took place here with Colleen, Marissa Clausen, and Rhys Howard from CDU scanning materials and processing images that had been deposited. Everything was clearly labelled and the staff were always ready to answer questions – there were even newly sharpened pencils on every table before we started! The Living Archive team were kept busy – Michael Christie was working with Mätjarra, Dhäŋgaḻ and Melanie on Yolŋu materials, Cathy Bow was checking spreadsheets to see which items were already digitised in the LAAL collection, or working through lists of names to find who could give permissions, and Haidee McKittrick assisted new deposits staff with auditing new materials and provided individual support to participants. ABC Open was there to document the process, filming the activities and interviewing the participants. Some of this will appear as part of their Mother Tongue project, and to promote both the Living Archive and CALL collections. Thanks to Will Tinapple and Jacqui Taylor for doing this, ably assisted by David Pollock from Batchelor Institute media, and to Jacinda Brown for photos throughout the workshop. We look forward to sharing some of the photos and stories here soon. Special thanks to all the participants, especially language workers from remote communities and Darwin who took the time to come and work on their languages and share their knowledge, and provide advice about permission pathways, and in some cases give permission. The goals of the workshop were certainly achieved, though the work is far from over. There is still much to do with cataloguing, digitising, OCRing, sharing files, and getting these materials out there through the CALL collection database and the Living Archive website. We’ll need to crowdsource much of this work, so we need some creative ideas of how to garner the power of the Internet, as well as on the ground with highly motivated traditional language owners. Maybe you’d like to help us? Visit the ‘CONTRIBUTE’ tab at livingarchive.cdu.edu.au to find out more. Linguists, language workers and librarians gathered at Batchelor Institute to sort through materials in Australian Indigenous languages. This entry was posted in Activities and tagged Batchelor, books, engagement, Gathering, search and rescue on July 14, 2014 by Cathy Bow.